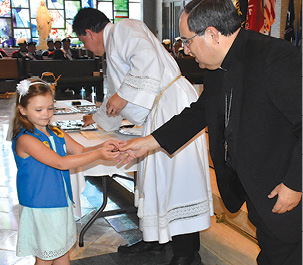 Bishop Michael G. Duca, fresh off his installation as the sixth bishop of the Diocese of Baton Rouge 48 hours earlier, dipped into his own background to encourage numerous Boy Scouts, Cub Scouts and Girl Scouts gathered at the annual Catholic Committee on Scouting Religious Award Ceremony at Our Lady of Mercy Church in Baton Rouge on Aug. 26. During the ceremony, which filled the church with parents, friends and relatives of the honorees, Bishop Duca handed out awards to not only the young scouts, but their adult leaders as well who earned the most prestigious honors available in the diocese scouting system. Bishop Duca said he enjoyed “every minute” of his time as a Cub Scout, Boy Scout and Explorer. He shared how his scouting roots run deep in his own family, from his dad, who was involved in scouting in a variety of roles all the way through his retirement years, to his sisters, who were Girl Scouts. He said his involvement in scouting taught him a love of the outdoors, camping and becoming self-sufficient. 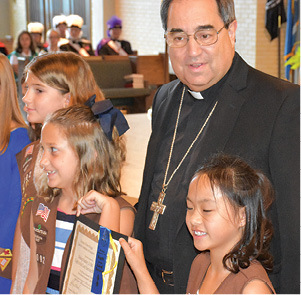 Bishop Duca poses with the members of the award-winning Girl Scout troops. He said the three foundations of scouting – physically strong, mentally awake and morally straight – helped him later in life, especially when he entered the seminary in his native Dallas. Bishop Duca admitted at that age he was unsure of what he had to offer, noting that he had not been particularly active in high school. 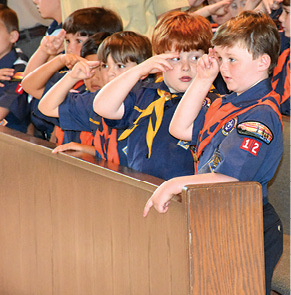 “When I got into the seminary, I began to realize I had done a lot of things in scouting,” he said, adding being a patrol leader and also participating in other roles provided valuable lessons in leadership. Bishop Duca blessed the awards and badges that he would later hand out to the adults as well as scouts. “I hope we continue to grow as the scouts and keep it firmly faith based as well as based on the principles of scouting that keep it going,” he added. During the ceremony, it was announced that Bishop Emeritus Robert W. Muench and Angela Poche were the recipients of the St. George Emblem, which is the highest award presented by National Catholic Committee on Scouting. The St. George Emblem recognizes an adult leader’s outstanding contributing to the spiritual development of Catholic youth in the program of the Boy Scouts of America. 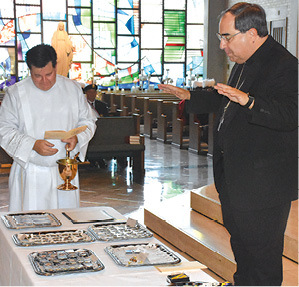 Bishop Muench, who was a strong supporter of the scouts, served as the bishop of the Diocese of Baton Rouge from 2001 until June, when he became apostolic administrator when Bishop Duca was announced as his successor. Bishop Duca presented the adult awards as well as awards to each of the youth winners. Poche, a member of St. Theresa of Avila Church in Gonzales, has served for 10 years as Religious Emblem counselor for Pack 65 and her many volunteer activities include serving as confirmation counselor at St. John the Evangelist Church in Prairieville. Jackie Daniels, Angela Diffendal, Scott Harrington and Louis Hebert were honored with the Bronze Pelican Award, which recognizes adults for their efforts in contributing directly to the spiritual nourishment of Catholic youth involved in scouting. Daniels has been involved in scouting for 45 years and serves as the Region 5 representative to the National Catholic Committee for Girl Scouts. Girl Scout Troop 10092 was honored with the Light in the Lord Bishop Stanley J. Ott Service Recognition Award. The award honors Bishop Ott and is awarded to scouting groups who demonstrate service to the community in keeping with the ideals as lived and preached by Bishop Ott. 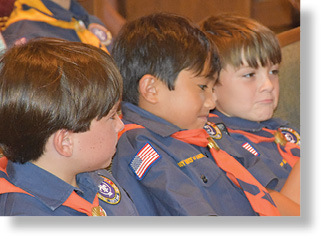 Some of the Boy Scouts are shown during the ceremony. 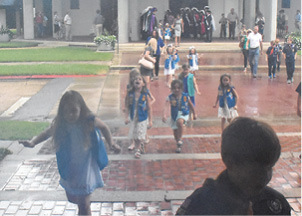 A reception was held in the parish hall across from the church following the ceremony, but those crossing the street were forced to dash through a summer rain. 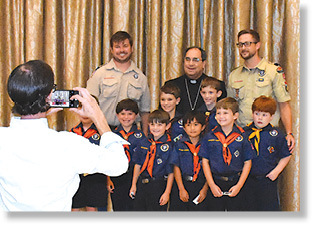 Bishop Michael G. Duca was popular as scouts and their families lined up to take photos with the bishop, who had been installed only 48 hours earlier.